This year’s achievements join the great company of previous winners who have made a distinct difference in IT and IT Service Management. Today, Pink Elephant announced the winners for the 2017 IT Excellence Awards during their 22nd Annual International IT Service Management Conference & Exhibition – “Pink18” – in Orlando, Florida, at the JW Marriott. Project Of The Year: Recognizes an organization that has demonstrated significant commitment to best practice frameworks including ITIL®, ISO, COBIT, Lean IT, and Six Sigma. Practitioner Of The Year: Recognizes an individual who has shown commitment to best practices, continuous improvement and quality principles. Innovation Of The Year: This award is in recognition of a product or service developed by the vendor community that has made the greatest contribution to ITSM in the last calendar year. IT Leader Of The Year: Recognizes an individual who works in a senior leadership role, promotes a clear vision for IT within the organization and has shown visible commitment to influencing and empowering the IT team to be successful in realizing their objectives. The Case Study Of The Year Award is chosen by conference attendees and will be awarded on Wednesday February 21, 2018, on the final day of Pink18. Practitioners are welcome submit their nominations for the 2018 IT Excellence Awards, which will be announced in February 2019 at Pink19. 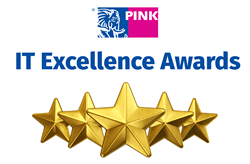 For more information about the IT Excellence Awards or to submit a nomination, visit http://www.pinkelephant.com.